Gennady Golovkin beats Daniel Geale via KO. 1st round: Great first round. No one is watching the time. That was a 4 minute round. Golovkin wins round 1. Golovkin cuts Geale via headbutt unintentionally. 2nd round: Great second round. Golovkin wins round 2 since he dropped Geale and landed the cleaner punches. 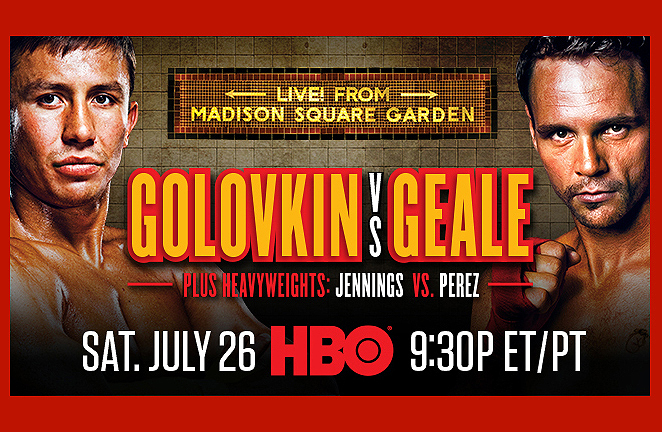 3rd round: Golovkin stops Geale in round 3! Ref stops the fight after Golovkin drops Geale. Geale’s legs were gone. 1st round: Feeler round. Perez wins round 1. 2nd round: Close second round. Not much action. Jennings wins round 2. 4th round: Perez looks tired. Jennings lander cleaner shots. Jennings wins round 4. 5th round: Both men land good shots but Jennings wins round 5. 6th round: Perez wins round 6. Jennings needs to let his hands go. 7th round: Great round 7 for Jennings. Jennings looks stronger all of a sudden. 8th round: Jennings nearly drops Perez in round 8 with great short rights. Jennings wins round 8 easily. Excellent round. Fight is coming through now. 9th round: Terrible round 9. Both men clinching way too much. Jennings wins slightly. 10th round: Jennings goes into southpaw mode. Jennings wins round 10. 11th round: Jennings wins round 11. 12th round: Great 12th round. Jennings wins round 12. Referee, Harvey Doc, deducts a point from Perez for a cheap shot. Terrible call.